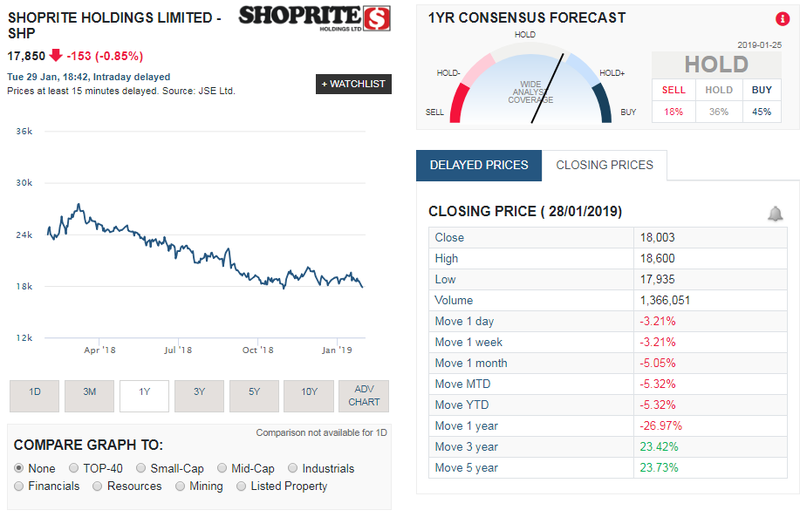 We take a look at the trading update released by Shoprite (SHP) that they snuck in after the market close today, probably hoping investors wont notice it. We suspect the retail armageddon that has been hitting Woolworths, Mr Price and Massmart will hit Shoprite hard after this trading update. Following the operational update for the 26 weeks to December 2018, the Group is in the process of finalising its financial results for the period. After the adoption of IFRS 9 and IFRS 15, the effect of the impact of Hyperinflation accounting as well as the transition to moving average cost for the valuation of stock, the company is satisfied that a reasonable degree of certainty exists that the financial results for this period is likely to vary by at least 20% from the corresponding period. - Deflation (the Group still had 10,719 items in deflation in December) in basic food categories in which the Group commands a higher than average market share. - Supply constraints stemming from industrial action and the deployment of a new ERP IT system resulted in lost sales in the period. Additional labour costs were incurred to ensure our supply chain remained operational and brought up to full efficiency over the festive season. - Adjustments relating to the change in accounting estimate between retail method of accounting and moving average cost impacted Gross Margin. - Cost increases in rentals, electricity, security, transport and depreciation could not be curtailed in line with the lower than expected top line growth. The Group remains positive about its operational strength, customer support for its brands and continues to make progress on its longer term strategic priorities. The transformational changes we made during the year-long migration to a new IT system were challenging, but the deployment has now been completed. January 2019 has seen the improved trading trend continue and we are confident of an improved second half as the impact of various once-offs continues to ease.